This year, West Coast are dominating the league in average hit outs per game. The Eagles have managed to rack up 52.8 hit outs each game in 2016, compared to a league average of 40. Melbourne are the league’s second-placed team for hit outs, thanks to the amply-bearded Max Gawn, but even they lag behind the Eagles by nearly 6 hit outs per game. West Coast’s ruck dominance will almost definitely wane a little over the next couple of months, as Nic Naitanui spends 6-8 weeks on the sidelines recovering from Achilles surgery. But how much can we expect the Eagles’ performance to slide? This is a difficult question to answer, as quantifying the contribution of any one player to a team’s performance is messy and inexact. But we can try to get a feel for how the Eagles might perform without Nic Nat by comparing the team’s performance in games with and without him over the past few years. When we do that, it looks like Naitanui’s presence matters quite a bit. From 2010 onwards, when he became a fixture in the Eagles’ best 22, Naitanui has played 133 games for the Eagles and has sat on the sidelines for 19. When he’s taken the field, the Eagles have averaged 49.8 hit outs per game, while their opponents have averaged 31.8, a difference of 18 net hit outs to the Eagles per game. 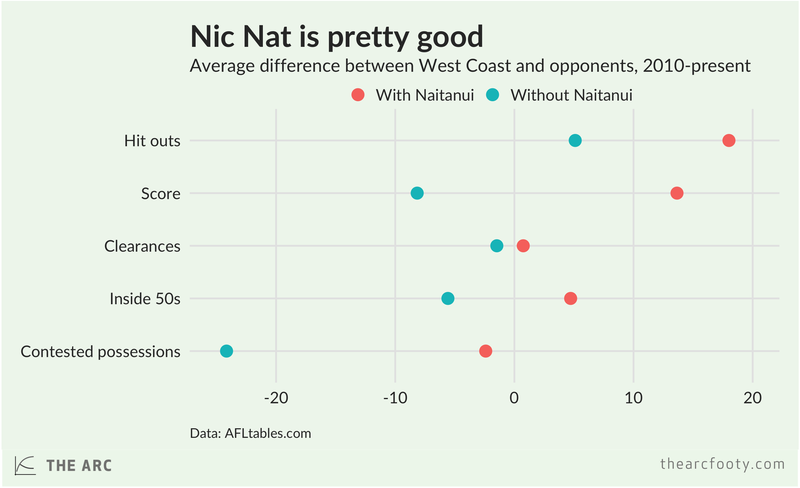 When Naitanui has been out of the side, that difference falls to 5.1 net hit outs per game, with the Eagles averaging 42.6 hit outs, against an average of 37.5 for their opponents. That’s a huge gap of nearly 13 net hit outs per game between the Eagles’ performance with and without Naitanui. When Nic Nat takes the field, the Eagles get a bigger advantage in hit outs, clearances, inside 50s, and contested possessions. Most importantly of all, there’s a gap of roughly three goals between the average margin in games featuring Naitanui and those without him. There’s good reason to think that individual players matter less in the AFL than they do in other sports, like basketball. This is partly just due to the size of the teams – only five people per team take the court at any one time in basketball, while eighteen per side run around the ground in our crazy sport. For evidence that individual players might not matter that much, just take a look at the Crows, who seem to be doing fine without Patrick Dangerfield this year. But for evidence that individual players can have a large impact, take a look at the Eagles’ performance with and without Naitanui. Previous article	← What is the worst losing streak in AFL history?